I had been looking forward to the weekend for a long time, seeing it as an opportunity to ride somewhere new and spend time with a good friend. However, what I couldn’t have anticipated was how inspirational and reflective an experience it would be. There were 200 cyclists registered for the weekend, two of whom are blind. Volunteers led their rides on tandem bikes, allowing them to participate in the cycling adventure just as everyone else. I was awed at their limitless attitude – by their openness to seek the means necessary to pursue interests that would be closed to them if they had any sense of self-pity. These are the people from whom we can really learn and take inspiration....individuals who approach life with a sense of optimism that allows them to work around obstacles. These are the people who tend to their grass so that it is the greenest they can make it. I was humbled seeing them and inspired to be a better person because of them. So, remember that though you may be overwhelmed or disappointed by what’s confronting you, you do have control of your attitude. 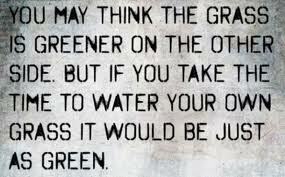 It will make all the difference to whether your grass is green or simply overlooked.